Dollar Day for the United Way returns to the Carrier Dome Wednesday, Feb. 22, prior to the men’s basketball game against Duke. At halftime, the University will recognize retiring United Way President Frank Lazarski just prior to presenting the United Way with a record-breaking dollar amount raised through its annual employee fundraising campaign. Prior to tipoff, Greek Life students representing Syracuse University’s fraternities and sororities will solicit fans for donations to the United Way. The students will stand at all Dome entrances, near concessions and in the backcourt wearing orange United Way tees and holding orange buckets. Fans can make a cash donation or buy an SU rally towel for $5. 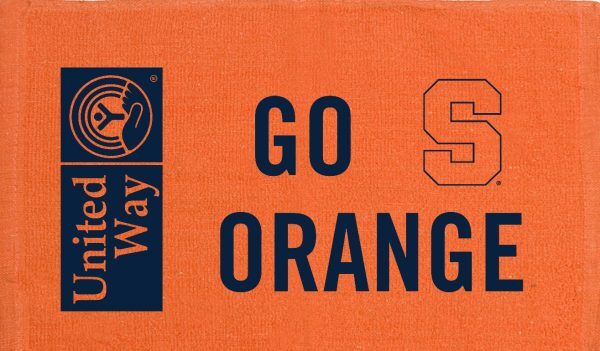 Fans can make a cash donation or buy an SU rally towel for $5 to benefit the United Way. Patrons who donate will be investing in the 91 local programs and services funded by the United Way of Central New York. This is the 45th year Syracuse University employees have conducted a campus-based fundraising campaign for the United Way. Dollar Day has been a part of that campaign for 20 years, giving students an opportunity to participate in the staff-led campaign. As the University’s official community partner, the United Way is featured during the game on video board messages and in audio announcements. The organization also runs a fundraising booth in the backcourt area. Concession stands, merchants and Club 44 are also equipped to accept fan donations electronically with each transaction, cash or credit. For more information on Dollar Day at the Dome, the Game Changer concession promotion, or the campus campaign, visit http://uw.syr.edu or contact Northrup at manorthr@syr.edu or at 315-427-7342.